Product #18708 | SKU LP36303 | 0.0 (no ratings yet) Thanks for your rating! 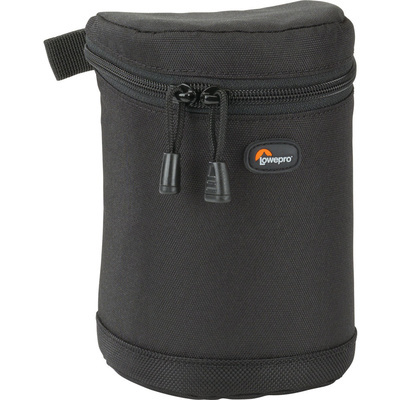 The black Lens Case 9 x 13cm from Lowepro is named for the dimensions of lenses it fits. For example, this lens case fits a lens up to 9cm in diameter by 13cm in height. Lowepro Cases are recognised world over for their reliability and durability. Built from tough nylon, this case offers you weather-resistance, portability and excellent protection for your valuable lens. Strong dual zippers provide access to the case that is lined with another thick layer of nylon. Lowepro has even thought to build in a convenient mesh storage compartment inside the top of the case so you can safely store the lens cap. This offers more time to hold your camera rather than worry about where your lens is stashed. Backed by a lifetime warranty, and at an affordable price, you get superior lens protection and peace of mind when you're out in the field.